Southampton, October 16th: England were held to a shock 2-2 draw at home to Macedonia on Wednesday, denting hopes of automatic qualification for Euro 2004. It was England's worst home competitive result since being held 0-0 by Greece at Wembley in a European qualifier in 1983. England's qualification campaign took an unexpected turn for the worse last night as Macedonia twice took the lead and continued to frustrate their supposedly superior opponents to such an extent that Alan Smith, a player hardly known for his calmness of temperament, was sent off in injury time having been shown a second yellow card. Macedonia's first goal, scored direct from an early corner, owed much to good fortune and the continuing fallibility of David Seaman, but England and Sven-Goran Eriksson can have few complaints after a display bereft of guile. 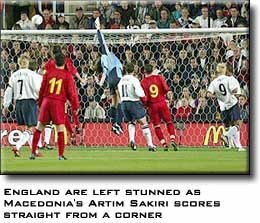 In a frantic 25-minute spell, Artim Šakiri beat David Seaman with an in-swinging corner in the 11th minute, David Beckham lobbed a quick equalizer and he ball came screeching in from Šakiri's left foot and yet it was almost a slow-motion screech as it became apparent that Seaman was not going to get this cross. Smith was at the back post but like Seaman and the rest of the stadium he was left flat-footed as the ball dipped in. Seaman must have been in agony. Thankfully for him England's lasted a mere two minutes. 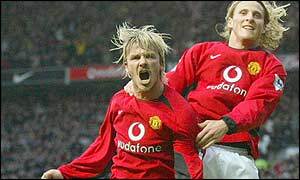 Scholes, operating more as a conventional central midfielder than the head of a diamond, collected the ball 40 yards out and clipped it forward to Beckham. With the Macedonia goalkeeper Petar Miloševski off his line Beckham produced the perfect lob. England should have been steadied by that, but with Gerrard enduring another bad night England kept ceding possession. Typical was Gerrard's 25th-minute flick in midfield that gave the ball straight to Šakiri. Within 10 seconds the ball was in Seaman's net again. Šakiri had his shot limply booted out by Campbell and Vančo Trajanov beat Seaman from the edge of the area. 1-2. Now this was a test. 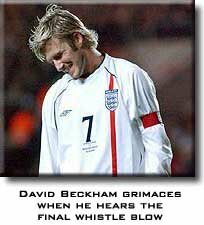 Owen, Scholes, Beckham and Smith all went close as England played some reasonable football but it was another defensive error, this time in the Macedonia area, that led to England's second equalizer. Scholes had volleyed back Beckham's cleared corner but the next volley was from Gerrard and it beat Miloševski easily. To add to the embarrassment, they also lost volatile striker Alan Smith in injury time to a red card - England's first since David Batty's in a Euro 2000 qualifier against Poland. The result sent World Cup semi-finalists Turkey clear at the top of Group Seven after a 5-0 win over Liechtenstein. They have nine points from three games with England in second with four from two. Southampton's last big event was the Titanic leaving in 1912, was mentioned by BBC. England paid a high price for poor defending with Seaman certain to be in the line of fire after the 39-year-old's blunder handed the initiative to a skilful and well-organized Macedonia. Sven-Goran Eriksson's bold experiment of using Southampton wingback Wayne Bridge as a left midfielder in his home stadium was soon overshadowed by the visitors' flying start. Douglas Bennet, there's no need for sarcasm, as Kevin McClean points out. "Why on earth do people underestimate Macedonia?" says a man wise after the event. "It was only a few years ago that they got a result against Ireland. Any team from the Balkans has a history of playing good football and I think it's about time we reassessed what England are capable of. The reason why we haven't won a thing for 36 years is simple: we have not been good enough!" Just before the event in a short interview of the English players, they didn't even know where Macedonia is ??? A city in Russia, in Africa, somewhere in south Europe... were their answers. In the Thursday early in the morning all of them went to the nearest bookstore to buy a geographical map of Europe to see where is Macedonia, the country that made silence at St. Mary's stadium to "The Great Albion". I was disappointed with the behavior of the England team at the end - they did not shake hands," said Macedonia's coach Nikola Ilievski. 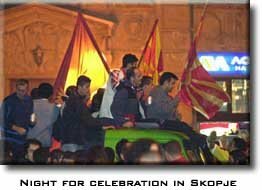 Cheering crowds of Macedonians gathered at Skopje airport today to welcome back their team after a stunning 2-2 draw against England in last night's Euro 2004 qualifier. People waved bright red and yellow national flags and chanted "Macedonia, Macedonia" as their new heroes returned after a result described by local television as the "greatest success in Macedonia's football history". President Boris Trajkovski sent a letter of congratulation to the team, ranked 90th in the world, calling them the "pride of the nation". "Your success will remain printed with golden letters in Macedonian sports history," the letter said. The celebration in the country started immediately after the final whistle, when thousands poured out on to the streets and many fired guns into the air. For many Macedonians who have never seen their small state of two million qualify for a World Cup or a European championship, a draw against the England was more than just a success. "It's not like we won the championship, but it put Macedonia on the world's football map. Finally, people will take us more seriously from now on," said one Macedonian fan. Several hundred supporters gathered at 6am to welcome back the team but their flight was severely delayed because of fog. Around 100 stalwarts waited until the plane finally arrived. The fans suffered a small disappointment when the worn-out players climbed straight on to buses instead of stopping to talk. "It doesn't matter, we know they're exhausted. They accomplished the most difficult task," said one supporter. The result also represented a leap forward for tense ethnic relations after an ethnic Albanian insurgency last year that took Macedonia to the brink of civil war. Both Macedonians and Albanians put enmity aside and celebrated together when Artim Šakiri, an ethnic Albanian, scored the first goal for Macedonia. They continued celebrating together throughout the night. The same night the Turks in Turkey didn't just celebrate theirs victory but the draw of this game in Southampton, because of their position far away from England in the same group.